Developers and users of coatings and coating formulations can benefit from a rapid method to maximize the performance of the coating by optimizing the ingredients in a formulation. When only one or two process variables are needed to be monitored, the problem is relatively simple. 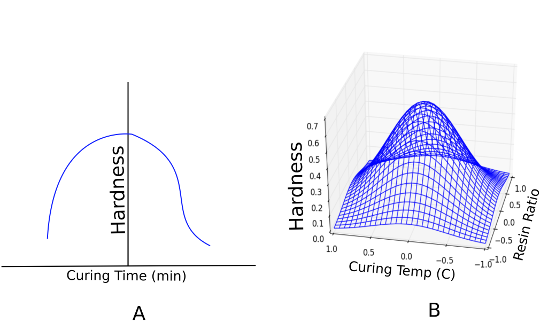 For example, if a certain coating formulation can be optimized (e.g., for hardness) by varying just one process parameter (e.g., curing time), one can run a simple experiment by curing the formulation for different time periods and obtain a plot of hardness versus curing time, as shown in Figure A. The same is true with only two process variables (Figure B). However, in practical situations, the performance of the coating depends on many variables, and it becomes significantly more complex to (1) determine the critical variables, and (2) optimize them. 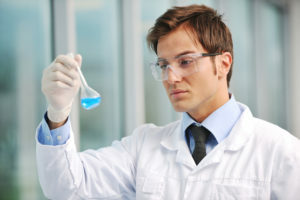 In this case, one can use a design of experiments approach, however it requires significant resources to run these experiments, which translates to a lot of time and money. An alternative approach is Machine Learning. Where, ŷ is the characteristic of the coating we need to optimize (e.g., hardness) and xi are different composition and process parameters (e.g., type and amount of monomer of oligomer, curing time, coating thickness, application rate), and f is a function of xi. The ML algorithms can determine the shape of f with a limited number of experiments (called training set) that can then be used to predict the value of the desired characteristic ŷ, with given inputs. Machine Learning can also be used to determine which parameters are more important (and need to be observed more closely during manufacturing) and which parameters are less important. The Machine Learning algorithm is applicable to all classes of coatings: waterborne, solventborne, solvent-free, thermally cured, and UV cured coatings. The technology can also be applied to Battery Optimization. Contact us today using the form below to explore how the ML approach can be adapted for your specific need in a cost effective manner.